TRADER 9: Trade of the day, DVAX!!! Trade of the day, DVAX!!! I wasn't going to trade DVAX today because it looked as though I already missed the bounce for it today in the pre-market when it went from about 1.91 to 2.40. Since I kept getting stop-out on TZYM earlier today I decided to look for a good entry point for DVAX at around 10:30p.m est knowing it probably won't break today's low of 2.22 with all of this volume holding it up. 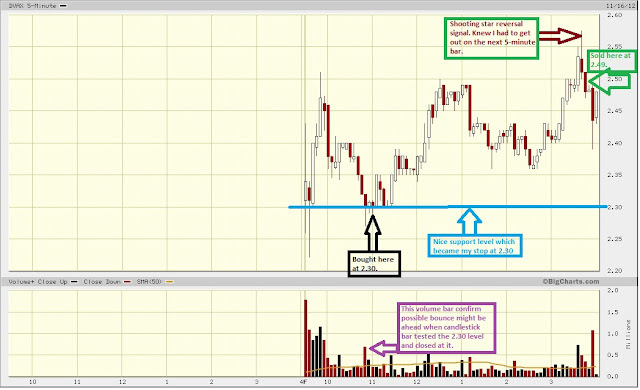 Went long 2000 shares @ 2.30 when it kept testing the intraday support level of around 2.30. My first stop was at 2.19, then I moved it to 2.30 after it broke through the 2.40 price range. Figuring that there might have been a lot of shorts in this stock I decided to hold it at least 15 minutes before the market closed hoping they'll start covering, and to my surprise it looked like the shorts started covering after 3:00p.m est and then day traders who were in here started selling at 3:42p.m est. Sold when a huge shooting star candlestick pattern formed at 2.49 for a .19 point gain. If you want to see what I might be trading during market hours and interact with me during my trading days, just follow me on twitter @tradermike9. Are you still going to trade TZYM next week? Yes, If I can get in at a nice support level. I think this stock might have a decent bounce soon. Are you mostly a day trader? @Anonymous. 80 to 90 percent of my trades are daytrades. I swing trade the rest. Trade of the day, VRSN!!! Trade of the day, HGSH!!! Trade of the day, TFM!!! Trade of the day, MMR!!! Trade of the day, RIMM!!! Trade of the day, KITD!!! Trade of the day, ELAY!!! Trade of the day, DMND!!! Trade of the day, IAG!!! Trade of the day, GALE!!! Trade of the day, BCRX!!! Trade of the day, MITK!!! Trade of the day, VVUS!!! Trade of the day, TAGG!!! Trades of the day, VRNG and HUSA!!! Trade of the day, GLUU!!! Trades of the day, CMVT and OCZ!! !